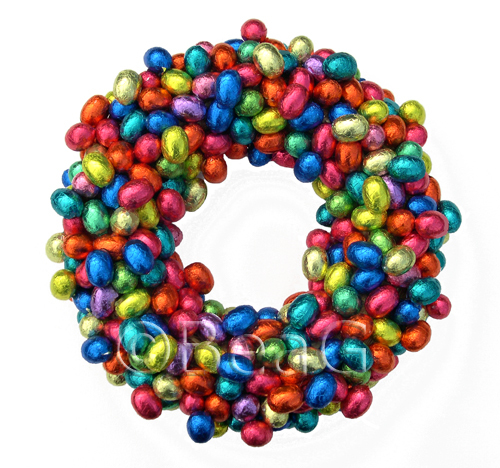 Here's a wreath I made, using 2 kilos of chocolate Easter eggs! Edited to add: I glued the wrapped chocolate eggs with a hot glue gun on a straw wreath. PS: we don't put our wreaths on the outside of a door. Instead we hang them on the wall of for instance our living room, put them on a mantle piece or a cupboard or a bookshell, etc. Or we ly them flat on a table, for instance as a centerpiece on a dinner table. This particular one should not be hung/put on a sunny spot! Or close to a chocolate addict..., lol. The opposite of war isn't peace it's creation! Thank you, SewEnthusiastic and Gamemom42! Gamemom, so true! I am a diabetic, so I won't eat them myself anyway (but my partner loves chocolate). How did you get them to stay on? Wouldn't hot glue melt the chocolate. It looks awesome. 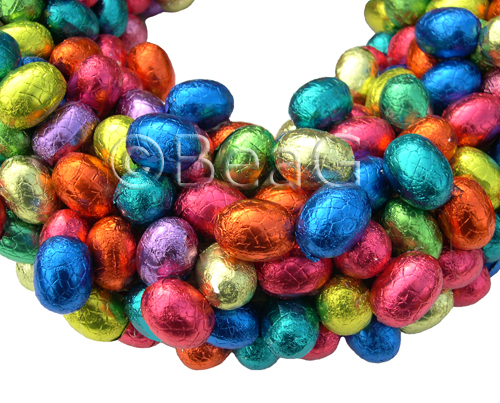 Colorful, shiny, CHOCOLATE. What's not to like! Pinky Yarn, I glued them on a straw wreath with a hot glue gun. I too was afraid they would melt. But luckily the glue cools down so fast that it doesn't melt the chocolate. Jummmmmmmmmy! Better keep it out of the sun. This is wonderful! It wouldn't last in my house though!